The results from the event emphasize the need for track-specific optimization. The setup was unchanged from Sonoma, where higher speeds and the rougher surface demanded more compliance and stability. The baseline Penske suspension settings, factory aero, and non-LSD were much more suited to Laguna Seca's traditional corners and longer straights than they were at Sonoma. The Exige rotated easily through the low-speed hairpins and only exhibited moderate oversteer in faster corners such as T5 and T9. The quick-wearing character of the RE-71R's was again apparent with the rear tires already worn past their prime by the end of this second day. The front brake pads wore down quickly to the backing plates, ending the day one session early and highlighting that the front brake bias of the factory setup can be easily overwhelmed by heavy braking into T2 with greater than stock power. Finally, the newly-fabricated Laguna pipe worked as expected allowing the Exige to fly by the T5 sound station without penalty all day. The SpeedSF Challenge S2 record still eludes us, set by a GT4 in 2017 with a time of 1:38.0. 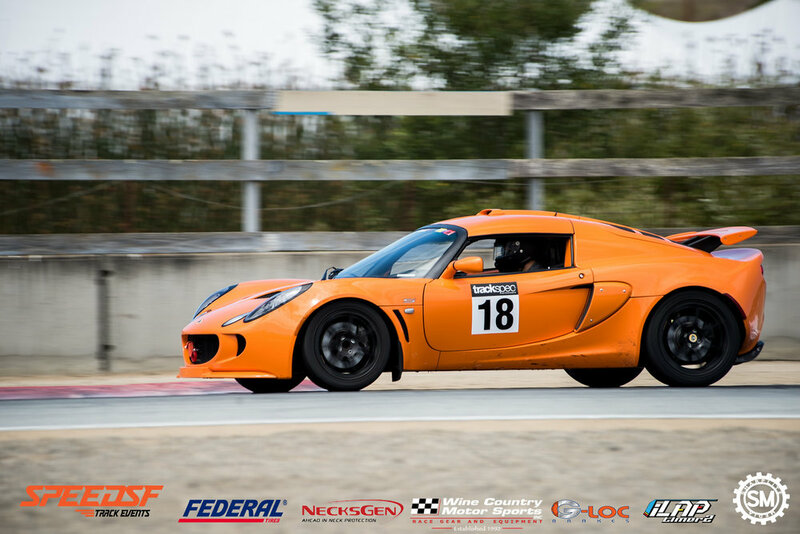 We plan to increase the grip at the Exige's rear axle and adjust its brake bias to better handle high speed stops. Hopefully, the Lotus can get closer to the Porsche's record with these changes.